We’re all excited about the launch of SpaceShipTwo today and fans of Virgin Galactic will be well aware of Galactic’s goals of carrying fare-paying passengers on sub-orbital flights in the coming years, but few people know about another Galactic project which is now gathering pace – the LauncherOne satellite system. Back in January 2009 early discussions between Virgin Galactic and Surrey Satellite Technology Limited (SSTL) in Guildford. SSTL is a world leader in the production of low-cost small satellites, and it was keen to explore the possibility of working with Virgin Galactic on a way to get these spacecraft into orbit much more cheaply than is currently possible. 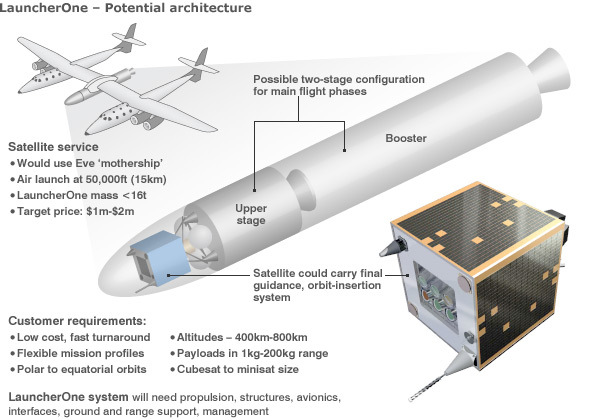 The concept would be somewhat similar to the US Pegasus system, which uses a former airliner to lift a booster to 40,000ft, before releasing it to make its own way into space. Virgin Galactic’s aim is to provide an air-launched system which is faster, cheaper, and more flexible. It would use SpaceShipTwo’s mothership, “Eve”, as the launch platform. Dr Adam Baker, then at SSTL, was originally hoping for funding from the UK government to do a small feasibility study. The hope was that if things came together, LauncherOne could be a UK-built rocket dispatched by Eve running out of a British airport somewhere. Funding from the government wasn’t forthcoming and Dr Baker has now moved across to Virgin Galactic to lead its own in-house efforts to give the project momentum. Certainly, there’s a compelling need for a cheaper, more flexible launch system for small satellites. At the moment, a small satellite wanting to get into space may have to pay something like $5m-$10m. Virgin Galactic really has to get that down to $1m-$2m for this venture to make financial sense. And to make that happen, Dr Baker believes the development cost of the rocket to first flight also needs to be kept the right side $100m. By utilising the technology and advancements that Galactic have recently made it would appear that the feasibility this will at last be possible. Astronomy Question of the Week: How is a black hole discovered?